Maybe the sizing isn’t well represented, the fulfillment house has mixed up SKUs, or your product images aren’t clear or detailed enough. If you can lighten the load for your customer support team, you can save significant time and costs, while at the same time improving the buying experience for your customers. 91% of shoppers would gladly try to answer their own questions first using an online knowledge base or FAQ page before reaching out to a customer service team, according to a survey by Coleman Parkes for Amdocs. This means that your FAQ page is a huge opportunity to answer your customers’ most common questions and issues so they don’t need to reach out to customer support. FAQ information typically falls into one of two distinct buckets: product-specific and buying process. Product Specific: Common questions about individual products may be better off addressed on the product pages rather than in a broad FAQ page. You may need to provide clearer or more comprehensive product descriptions, or consider more or better photography to clear up common product questions. Buying Process: Questions about shipping, returns, policies, and other operational topics are best addressed in a single easy-to-find page like an FAQ. When is the last time you cross-checked the content of your FAQ page with the data from your customer support team? There are many customer support tools like Gorgias that will make it easy for you to track the reasons behind why users submit a ticket. Once you begin tracking the topic, or tag, of your questions, you can easily identify the questions that top the list, and permanently add the responses to the FAQ. Bonus points: Prioritize the FAQ page based on the frequency of each customer service inquiry so that the most relevant answers are closer to the top. 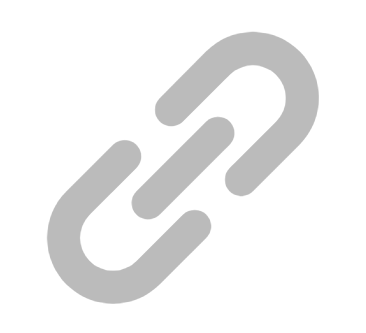 What are the most frequent topics of support inquiries? What issues take up the majority of your support team’s time and resources? What issues are emerging or could emerge do to seasonality or new initiatives within our company? If shoppers can’t find it quickly and easily, they won’t use it and all your work answering all of their questions will go to waste. If you have an answer on your FAQ page, yet people are still inquiring, they might be having trouble finding the page. Include a search bar so that shoppers can easily find the answers for their specific problem without having to read through everything else. Use simple, conversational language. Technical slang gives most of us a headache, and leaves most people reaching for the closest live human to explain it in terms they understand. For more on FAQ pages, check out this Shopify article. Now that you have your FAQ page squared away, be sure to track visitors to the page and note any changes in volume, and look for changes in your support ticket volume around those related questions. Remember: You should never answer a support ticket only by referencing your FAQ page. Always include the information they are asking for directly within your response. After that, let the customer know that there is an FAQ page for more information, to avoid future tickets. Have you watched actual customers explore your online store to see where they stumble? 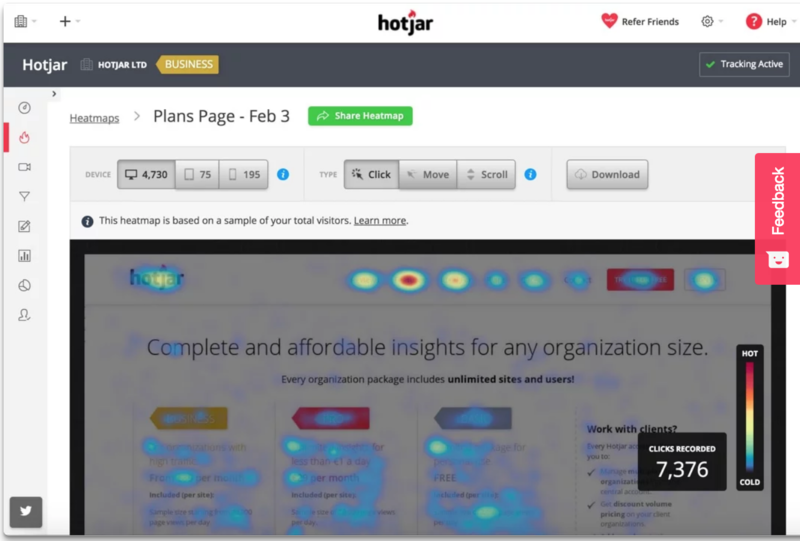 Customer behavior tools like Hotjar make it easy to review how customers navigate your website. One way that customer behavior analysis tools can help you understand exactly how your customers are using your site is with heat maps. A heat map is a visual representation of the most popular (hot) and unpopular (cold) elements of a website page. They can give you an at-a-glance understanding of how people interact with individual website pages. Elements that get the most views and interaction are shown in red, so you can immediately spot what your users are clicking on. Those that most people tend to ignore appear in blue. Once you know which parts of your website are most (and least) useful to shoppers, you can tweak those elements to make the on-site experience easier to use. 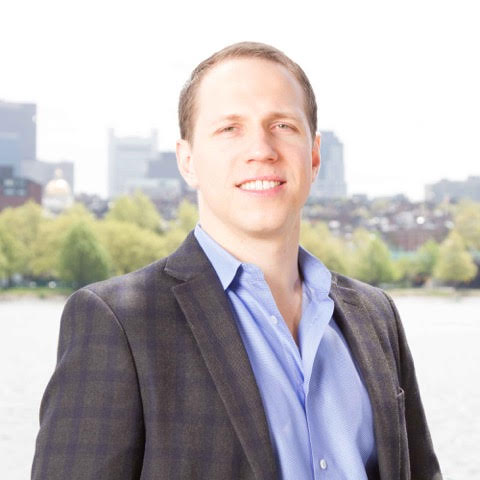 It may require some A/B testing to ensure your changes deliver results. According to a recent Shopify post, during the holiday season, Ecommerce returns surge to 30 percent (or as high as 50 percent for “expensive” products). Return deliveries are estimated to exceed $550 billion by 2020 in the U.S. alone. Many of those returns are probably associated with a customer support ticket - whether customers are asking questions about the product they received, or need help processing their return. Anything you can do to reduce the number of returns - and the number of customer support requests associated with them - can mean a huge boost for your bottom line. All of these problems (and more) can be prevented in advance with improvements to your website content. While fit can be a difficult factor to get right online, including detailed dimensions is a big step in the right direction. 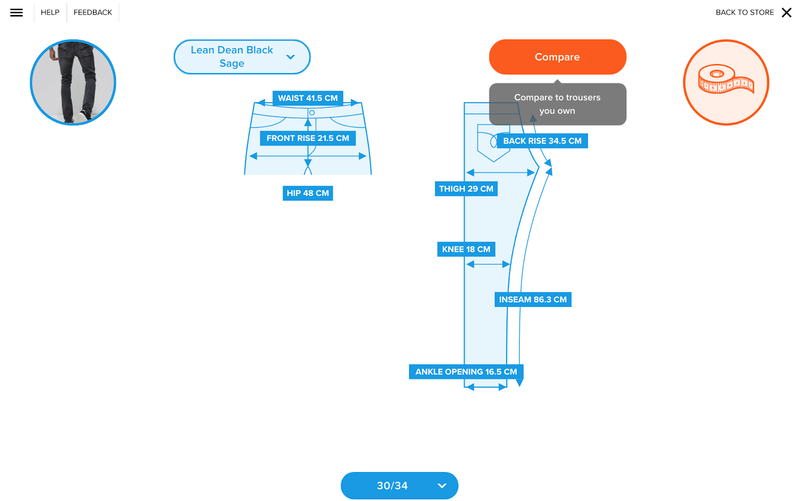 Some apparel merchants are taking sizing one step further with interactive fit guides, like the one above Nudie Jeans, which uses an app integration called Virtusize:. Poor quality or not enough product images can make it difficult for customers to accurately understand what your product will look like when it arrives at their home. You can easily reduce your return rate by making sure your product photography is clear and high-quality, and illustrates all of the primary parts of each product. More complicated or detailed products can also benefit from a video or 360-view. Detailed product descriptions can also help address confusion about product appearance and feel. Sol de Janeiro does this with a multi-tab product content area that defaults to a brief product highlight, with additional tabs to provide more details. Are orders not being fulfilled to the right customers? Are deliveries taking longer than they should? Analyzing your fulfillment data and using that information to make adjustments to your website content - such as average delivery times - can help eliminate a source of customer support calls. For example, maybe you want to be able to deliver every order within two days, but your current fulfillment resources simply can’t make that happen consistently. Being up-front and clear about realistic delivery times (like The Black Dog does in their Shipping FAQ page, above) will help set customers’ expectations appropriately. 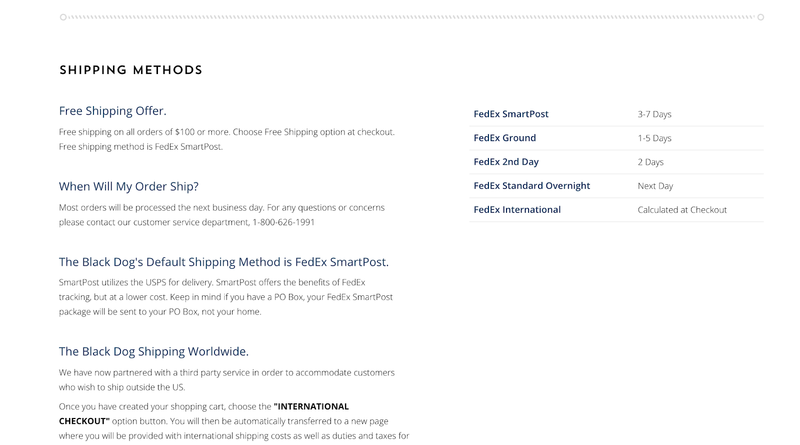 Bonus: To get setup on two day shipping, consider our partners at ShipBob. Continue to study your on-site data using Google Analytics or Shopify’s native analytics and look for high exit % pages. These may be pages where prospects or customers are running into a dead end and being forced to turn to support. You can also create a goal in Google Analytics that corresponds to contacting support, then reverse the user path to determine which pages lead to them submitting a ticket / hitting that “contact” or “support” button. Chances are, there are a few areas of “low hanging fruit” that can make significant improvements to your customer support load once you find them and address the root concerns. And with those small fixes, you could see a big impact on your bottom line, and a better on-site experience for your customers.